The whole world is our family. It is our heartfelt wish to see everyone in every nation living in peace and prosperity, free from the threat of crime, terrorism, and war. Even though there are many sincere individuals and organizations dedicated to the cause of peace, establishing permanent peace requires more than political agreements, discussions, or attempts to maintain a peaceful mood. Permanent peace can only be achieved through a transformation at the deepest level of the human mind and physiology. Extensive scientific research has shown that the Transcendental Meditation® technique* produces a profoundly calming effect in the body and mind. Further research has shown that this calming effect extends to the surroundings. When individuals practice the Transcendental Meditation technique and the advanced Transcendental Meditation Sidhi Program®* together in groups, they create powerful waves of coherence and peace that spread throughout the environment. The research on this effect has shown a dramatic and immediate reduction in societal stress, crime, violence, and conflict and an increase in positivity in the society as a whole, nationally and internationally. The reduction of violence and conflict through the group practice of the Transcendental Meditation and Transcendental Meditation Sidhi programs is the most extensively researched and thoroughly field-tested phenomenon in the history of the social sciences. It has been confirmed by more than 50 demonstrations and 23 scientific studies. This research has been carefully scrutinized by independent scholars and accepted for publication in top peer-reviewed academic journals. *The Transcendental Meditation technique and its advanced techniques were brought to the world by Maharishi Mahesh Yogi. Please enjoy our Founder’s Page for more information about Maharishi’s contributions to our world. The individual influences the surroundings through every thought, word, and action. People who are calm and happy naturally radiate a peaceful, coherent influence in their surroundings. When many people in a society are unhappy and tense, the atmosphere becomes saturated with stress — crime, terrorism, and war are the inevitable result. As long as many individuals in a society are filled with stress and tension, peace can only remain an abstract and fragile idea. The simplest, most cost-effective way to end the epidemic of stress and violence in our world is to create permanent groups of individuals practicing the advanced programs of Transcendental Meditation together morning and evening. These groups will silently neutralize social stress and maintain an influence of positivity and coherence in the collective consciousness of any city, province, or nation. To produce the desired effect, the number of individuals required is equal to the square root of one percent of the population. A group of 8000 together in one place would create sufficient life-nourishing coherence to neutralize the negative tendencies of the whole world’s population and create world peace. The Mother Divine Program, established in 1981, is one of the most long-standing permanent peace-creating groups in the world. In their professional peace-creating role, the Mother Divine participants are silently radiating a powerful, nourishing influence of coherence in world consciousness every day through their extended practice of Transcendental Meditation and its advanced programs. The goal is to create a group of 1000 Mother Divine on each continent to benefit the whole world most profoundly. Open the tabs below to learn more. Click here to support the permanent peace-creating group of Mother Divine. 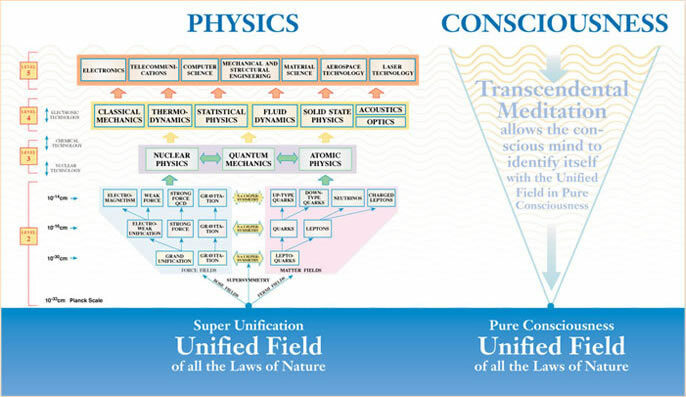 This fourth state of consciousness is universally accessible through the Transcendental Meditation® technique and the Transcendental Meditation Sidhi Program® including Yogic Flying. These techniques are the most widely practiced and extensively researched technologies in the world for the full development of human potential. The unique effectiveness of the group practice of Transcendental Meditation® and the Transcendental Meditation Sidhi Program® in preventing social violence, terrorism, and war, has been confirmed by more than 50 demonstrations and 23 scientific studies. This research has been carefully scrutinized by independent scholars and accepted for publication in top academic journals. In every case, this approach produced marked reductions of crime, social violence, terrorism, and war, and increased peace and positivity in society. A critical experimental test of this approach was conducted during the peak of the Lebanon war. A day-by-day study of a two-month assembly in Israel in 1983 showed that on days when the number of participants in this unified field-based approach to defense (‘TM Group Size’, right) was high, war deaths in neighboring Lebanon dropped by 76% (p < 10-7 ). In addition, crime, traffic accidents, fires, and other indicators of social stress in Israel (combined into a composite index) all correlated strongly with changes in TM group size. Other possible causes (weekends, holidays, weather, etc.) were statistically controlled for (Journal of Conflict Resolution 32: 776-812, 1988). To learn more, see expanded scientific research on the Transcendental Meditation program here.